Yes, we're all pretty disappointed that October is over, but even with Thanksgiving looming I figured I had at least one more Halloween related post in me...So here it is. 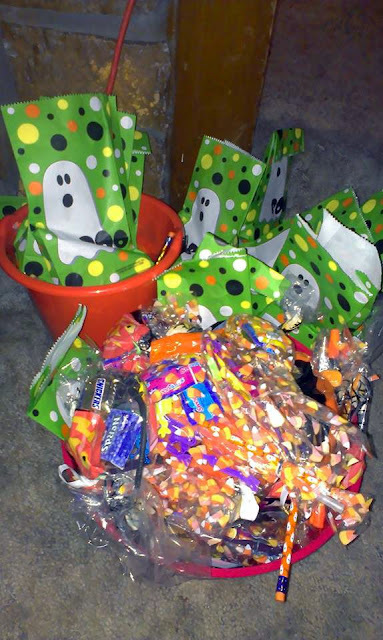 Halloween was pretty successful at our place, we successfully ran out of candy well before 9:00 PM. While our neighbor's yard decorations easily massacred ours, I think it's safe to say we kicked their asses when it came to what each TOT received when they rang our doorbell. I spent too much time on some of the indoor props, next year I think I'll work on adding more items to the yard. November 1st is always a bit of a bummer, but the day was not a total loss. We scavenged a local Michaels and stocked up on some stuff for next year. Everything was 80% off...I really regret not getting more. There's a good chance there's some odds and ends left though, so if you haven't hit up the craft chain now is the time to do so!